This sculpture was made as a result of Kate's residency at the Rwenzori Art Centre in Kasese, Uganda, where she researched the cultural and spiritual beliefs of the Bakonjo people. 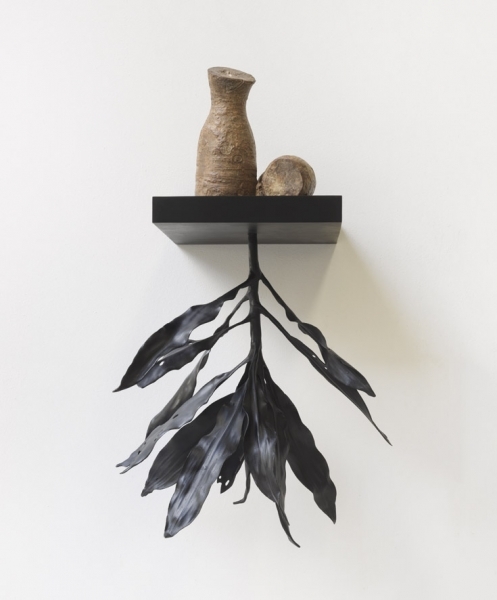 "Following on from my previous artwork l was drawn to the rituals surrounding death and discovered that the 'Muramura' plant/tree was a potent symbol used on traditional graves, planted in a circle, above a round hole that was dug to bury the person in a foetal position. This tree would also be avoided by passers-by, if found planted in anyone's field. 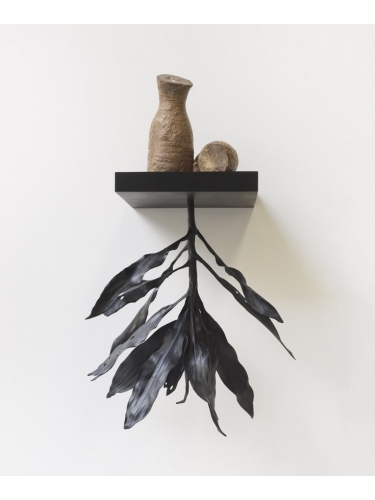 Here the 'Muramura' plant is intentionally inverted, as if below ground, and above it are two local Ugandan Yams, which have been patinated with the local earth and represent fertility, growth and reproduction. The platform that the sculptures are attached to is positioned high on the wall, indicating a more unusual and spiritual perspective, with the idea of above and below, life and death."